Taranaki broadcast band DXer on 30 December after a long period of illness. Close friend and DXing colleague BILL WOLLER recalls “Robin was like a brother to us. I was also his best man when Daphne and Robin married. Never a cross word and always in good spirits. He first arrived here at our place on Longfellow Road Opunake way back in 1953. He was going to the Opunake High School and got to know my brother and came up with him after school one day. I was messing around with my old Wards Airline radio and running wires around the section and Robin was immediately interested. 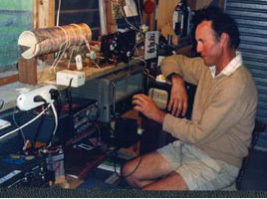 After hearing American medium wave stations KWKH and XERF and other old reliables, he went further and found out about the NZ Radio DX League and we both joined. Robin lived on his parent’s farm at Namu Road and soon had antenna wires running in all directions.